On December 8 we will have our very first graduation ceremonies for the Pastoral Formation course that was started in 2014! Of those students who are graduating, two are already involved in church planting, and the others, for the time being, are working alongside the pastors of their churches. In October, two of our students had to drop out of our Pastoral Formation course due to health issues. Another couple has informed me that, while they will finish this semester, they will not be able to continue on next year due to their schedules. Perseverance is one of the biggest challenges Seminary students face. The majority of our students have families, work full-time, come to the Seminary directly from work and study until 10pm. Then they go home to spend a brief period of time with their family. Wednesday evenings and weekends they are highly involved in church ministry. It is very common for them to spend all of Saturday and Sunday at the church. It is a very demanding schedule. Brazil has been going through its worst recession ever and that has created an extra burden on our students. We are sad to see these students struggle, and we continue to walk with them through these challenges. In September, one of our Seminary students, Suheila, traveled with a team from her church to Pittsford, NY. This student’s church and Pittsford Community Church formed a partnership and this was the first time Pittsford received an entire team from Brazil! After arriving back in Brazil and traveling by car to their city, five team members, including my student, were involved in a very bad car accident. We praise the Lord that all survived, however, my student suffered the most trauma and is still recuperating. Paulo and I had the privilege of being interpreters for an American missions team from Florida. The purpose of their trip was to do door-to-door evangelism in a neighboring city where one of our Seminary graduates pastors a church with five different congregations. The team worked in the neighborhood of the two newest congregations that are church plants. One of our visits that stands out was when we visited the home of an elderly man who is a minister in his Pentecostal church. I watched him shed tears as one of his grandsons accepted Christ. What a special moment to share with this grandfather who had prayed for this moment to happen. It was a wonderful reminder of God’s faithfulness to us as this man, who is recovering from a broken femur, was able to see God answer his prayers. In October, Paulo and I were privileged to participate in two missions conferences in Canada! We spent a week at the Engage Mission Conference at Brentview Baptist in Calgary and were also able to take in the Greater Calgary Missions Conference. The week after we were at the Greater Edmonton Missions Conference before coming back to Brazil. We are so thankful to Brentview for having us come. We were also so grateful to reconnect with so many of you at the different events that were held. 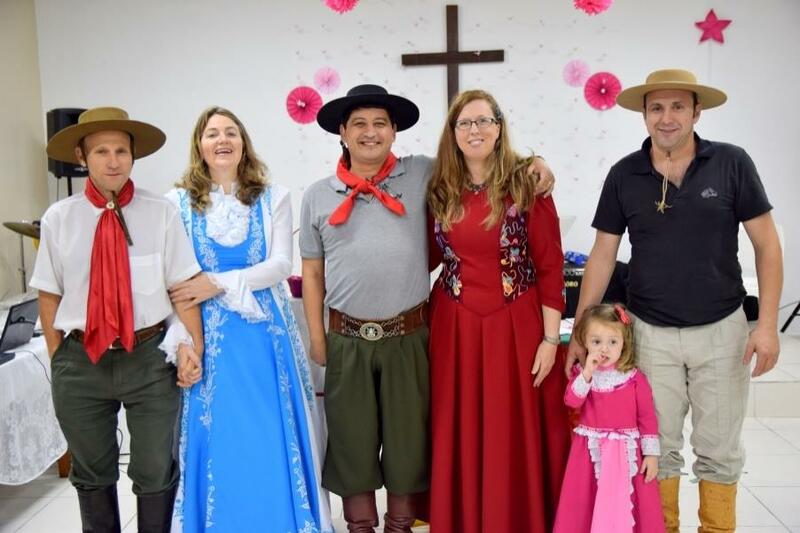 Members of our church with us in traditional gaucho clothing. Thank you for praying for Luciana! She is getting stronger! It has been exciting to see how God has brought together a partnership between our church and TeachBeyond, Paulo’s missionary organization. Through this partnership, our church is in the process of changing its constitution so that it can open a training school called TeachBeyond Academy Brazil. The academy is designed to be a tool to reach the community for Christ as well as improve their quality of life and will offer classes in computers, languages, music, Bible, as well as classes to help adults get their GEDs.